Long before Miss Bates was ever a spinster, she read all the Pippi Longstocking books she could get her hands on. It was with a nostalgic smile that she read Chief Greta Rose’s assessment of our romance heroine and amateur sleuth, Chloe Humphrey, in Amanda Flower’s first Appleseed Creek cozy mystery, A Plain Death, “You’re like the Pippi Longstocking version of Nancy Drew.” Our red-haired geek girl and wanna-be detective continues to eavesdrop, interview, investigate, and fight for truth, justice, and the Amish way in Flower’s second cozy mystery, A Plain Scandal. 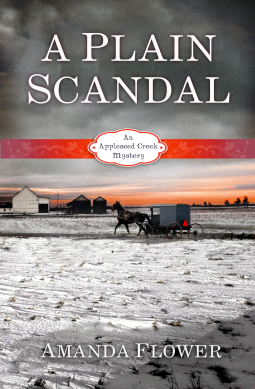 In this case, she’s in pursuit of the culprit who is cutting off the beards of Amish men and Amish girls’ long hair … until these nasty shenanigans turn to murder, the murder of a successful young Amish man, Ezekiel Young. Everything good that Miss Bates said about the first book in the series still stands in the second. The gently theological ethos is present and well portrayed, the hero, heroine, and their growing closeness is lovingly rendered, Chloe’s voice rings steadfast, humble, and funny, the atmosphere of small-town foibles and big-time sins is sketched with the same consideration. And yet, for Miss Bates … a little ennui set in. She missed the presence of the romance as front-and-centre. She feels like a fair-weather friend to the cozy, but there it is. There’s something that happens in the mystery novel that turns ho-hum for Miss Bates. She thinks it’s the plot-driven quest for clues, this relentless interviewing of witnesses, scooping out and aligning of tips that is information- instead of emotion-driven that leaves the mystery in the dust on the road-race to her reading love. There is less character development in the second book because, of course, we’ve learned a lot about what makes our hero and heroine tick in the first. Becky is still there, as is Grandfather Zook, the Troyer clan, the feisty chief Rose … and this is where the mystery and Miss Bates parted ways, in this entrenching of character that is its bane. Even the poetry-writing Dalgliesh petrified for Miss Bates. And her imaginary television boyfriend, Christopher Foyle, lost her after season three. The Amish controversies and conflicts surrounding the politics and governance of the community that continue from book one are very interesting. They are focused around how open the community can be and still retain its core religious identity. The humiliating crimes of beard- and hair-cutting that initiate the mystery are key to understanding the difficult position niche communities inhabit in the melting-pot of America, “the world is too much with us.” The resolution to the murder, the who/why-done-it, in this second book, is quite puerile and the villain bug-eyed uninteresting. The inspirational tone is more subdued than the first, but the still-inspirational-identity of the novel, of course, doesn’t leave room for the motive to be Dalgliesh’s “love or lust;” therefore, “lucre” is once again the culprit. There are two scenes that coaxed Miss Bates out of her reading pout and that you shouldn’t miss. One is … yea for romance … Chloe and Timothy’s first kiss! 🙂 The second is an homage to one of Miss Bates’s favourite scenes in a novel ever: Scout in her ham costume in To Kill A Mockingbird. This hilarious scene involves Chloe, a lot of cotton batting, a snow-man costume, and a float in Appleseed Creek’s Thanksgiving Day Parade. One of the endearing aspects of this second book is how Chloe is beginning to feel like she belongs, has friends, a family, a man who loves her. She has emotional attachments in the town and it’s heart-warming to experience her arrival at these realizations. Chloe had a Jane Eyre-ish childhood and near-orphan-hood in the first book that is heart-breaking. It’s great to see her belong and be loved. Miss Bates leaves the cozy behind for now, only to await a little dipping of the toes in its waters when the third book comes out. As Chief Rose, once again, characterizes Chloe, there’s something about our “Amish whisperer” that one cannot resist … at least in small doses. The “mind” here is still “lively and at ease” Emma. As a reading experience for Miss Bates, it served only to be “almost pretty” Northanger Abbey. What about you? Do you have a point of malaise regarding a certain genre? From whence does it stem? And just to satisfy Miss Bates’s curiosity, are you a Pippi Longstocking fan? Did you read the books? Watch the TV series? I am constantly reaching a point of no return with long-running mystery series–the number of series that I have abandoned after 3-6 books is legion. It is always because I get bored with the characters or because I don’t like them and I don’t care what happens to them. “Too many books, too little time” is my reading motto. I have never felt the need to be ‘loyal’ to any set of characters. And I do reach a saturation level with a genre from time to time, so I’ll switch it up–I read across most of the genres, so that’s no problem. I agree. I don’t feel loyalty necessarily to any series, especially mystery (somehow mystery makes me “feel” the formula more than romance), but I do feel loyal to authors who, even when their books are flawed, remain interesting to me. Now, I am guilty guilty of starting a series, liking the first book so much that I, obsessively, buy all the others … and line them up with a smirk of satisfaction. Read the second book, or third, and totally abandon them thereafter. That is hard on the pocket book, so I’m trying not to do that anymore. I think you have the best approach: to mix it up, read across genres. I think it’s totally cool that you borrowed all the boys adventure stories. I never read the Pippi books, but watched the TV series. I think it satisfies something in a kid, the fact the Pippi is so self-sufficient, so free of school and parents. She’s really quite Rousseau-esque? in her growing up without any societal influence. It’s a kiddie-independence fantasy and certainly the fact that she was no girly-girl appealed. I never got into Nancy Drew and mainly read tons and tons and tons of historical fiction, big tomes of books that I loved: Thomas B. Costain (who’s ever heard of him?) and Taylor Caldwell and James Mitchener, got into Leon Uris … until the day I read The Thorn Birds, that was cool. Well, of course I’ve heard of Costain and I do believe I’ve read everything he wrote, even his multi-vol history of the Plantagenets. I still have his book about the leMoyne family, and the Attila the Hun one. I don’t know what happened to my copy of The Black Rose or Below the Salt. When I was in high school my books of preference were the big, fat historical adventures with romance. In addition to Costain, I read most of Sabatini, Samuel Shellabarger, Lawrence Schoonover, Orczy, all the Graustark books, etc etc. Have you ever tried any of the Victorian era ‘inspirationals’ ? I’m think Agusta Evans Wilson (St Elmo in particular) or Florence Barclay (best known for ‘The Rosary’). Oh what a joy to find another Costain fan … !! The reading cup runneth over. I read THE BLACK ROSE over and over again, till the pages fell out. I too lost my copy, well lost all my copies of beloved books when my basement flooded over 20 years ago. Sniff. 😦 It’s so good to hear about someone enjoying these books. I believe they’re out of print? I love Victorian lit. and have read a lot of well the obvious ones like Mrs. Gaskell’s, also Mary Elizabeth Braddon. But the Victorian “inspie,” how cool is that! Thank you very much for the suggestions, I’ll be sure to look for them. I did like the Pippi books as a girl, but I was much more obsessed with the Oz books around that age. Sadly, my girls don’t really get into either of these series… Harry Potter is marvelous but he’s ruined them for loads of other wonderful books that I think seem too pale or too slow by comparison (this is my guess, based on how they talk about what they’re reading). Wow, the Oz books … as in Wizard. Miss Bates never got into those; as a matter of fact, she didn’t read any until she TA-ed a B.A. course on children’s lit. Now, she did read Anne of Green Gables and Little Women obsessively; the childhood copies have pages flying out. But it also may explain how she ended up being Miss Bates! I read all of LM Alcott right alongside my Oz fascination – Jo’s Boys an alltime favorite, along with Under the Lilacs. I was so happy when one of my girls went as Louisa for her social studies “living history” project last year! The Oz books are a family tradition – my grandmother hailed from Kansas and she used to let me choose one of her Oz books to take home (first editions, from her childhood)each time we’d travel to visit her in NY, where she lived when I was growing up. They are fascinating and have an unusual epic yet domestic quality. Oh, how wonderful that one your girls went as LMA; I just love it! And I loved those books … especially Jo. I most definitely identified with her bookish, writerly ways. Though limited in portraying the books’ scope, I do like the film version.